Our Apollo 13 escape room, which we named “Houston, We’ve Had a Problem”, is one of the most realistic escape rooms in the United States. Ready for a fun challenge that you won’t soon forget? Located in the heart of Houston’s Midtown District, The Escape Hunt Experience is Houston’s Premier Escape Room and offers a true “experience” where you are transported to another era or place. 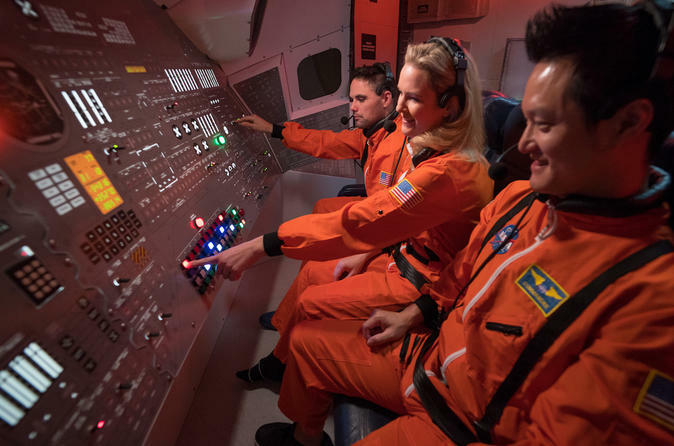 You and your team are locked in Mission Control where you work together to find hidden clues and codes and solve challenges in order to return the astronauts safely to earth and escape the room as a Team in under 60 minutes. You can’t visit Houston (Home of NASA), without experiencing this exciting adventure based on Apollo 13's near tragic lunar mission. The moment you walk through our front door, the experience starts as you are transported into the study of Sherlock Holmes, complete with period furniture, a fireplace, cooper ceilings and chandelier. We are centrally located in the Midtown District, known for its many fine restaurants, food options, and fun bars. Please plan to arrive 15 minutes before your scheduled start time. We provide complementary parking in our parking structure, so no worries on what to do with your “wheels” while you enjoy your time with us. The most realistic Escape room in the U.S. is patterned after the Apollo 13 Lunar Mission that has been called ‘the successful failure’. You and your team will be awed by the realism and fun of this escape room. Working under pressure, your team will need to help your astronauts return home safely from space. You have 60 minutes to save the crew. Failure is not an option! Saving your Apollo astronauts and escaping the room will require you to work together as a team under the pressure of a time limit. Great fun for family, friends and co-workers. Plan to allow 90 minutes for your total experience which includes a game debrief, complementary beverages and photos.